If you don't want to be surprised by what your credit card company does, read and understand all the credit card terms before signing up for a card. The disclosure statement spells out crucial information. Reading credit card disclosures can seem like deciphering a bunch of mumbo jumbo. But disclosure statements contain the critical information you need to make an informed decision about which credit card to choose. Here are some of the main things to look for when reading through credit card terms. What Credit Card Fees Are Involved? Among the fees associated with a credit card are membership fees that may be called annual, activation, participation, or monthly maintenance fees. Depending upon the credit card, these fees can be a one-time or recurring charges. The cost of such credit card fees can range from $6 to $150, according to the Federal Trade Commission. Try to find a card without an annual fee. The credit card terms should also disclose fees for late payments, going over the credit limit, and cash advances. Most people focus on credit card rates when signing up for a card. It's important to look at the annual percentage rate (APR) to know the true cost of using a credit card. The disclosure statement should outline when the APR can change and which index, such as the LIBOR, is used to determine new rates. The periodic rate is the interest rate that is applied to the outstanding balance to calculate the the finance charge during each billing period--for example, a monthly periodic rate is your APR divided by 12. The grace period is the number of days you have to avoid finance charges by paying a balance in full. If there is no grace period, the finance charge may begin to accrue from the date you actually make a charge or the date a charge is posted to the account. What's Involved with Balance Transfers? 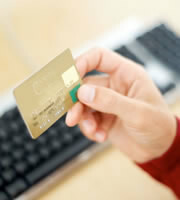 Balance transfer credit cards may have fees for the privilege of moving a balance from another credit card. Although many balance transfer offers have low introductory interest rates for a period of time, you may end up paying a one-time balance transfer fee. This fee is usually a percentage of the transferred balance and may be capped at a certain amount. If you are late with a credit card payment during the introductory rate period, the interest on the transferred balance usually increases. Also keep in mind that new purchases are usually charged higher interest than balances transferred under an introductory rate. Although nobody enjoys wading through the fine print, credit card disclosure statements are a valuable source of information. By spending the time to understand the details of credit card offers, you'll reduce the chance that you'll be hit with any nasty surprises. 0 Responses to "Why Reading Credit Card Disclosures is Important"